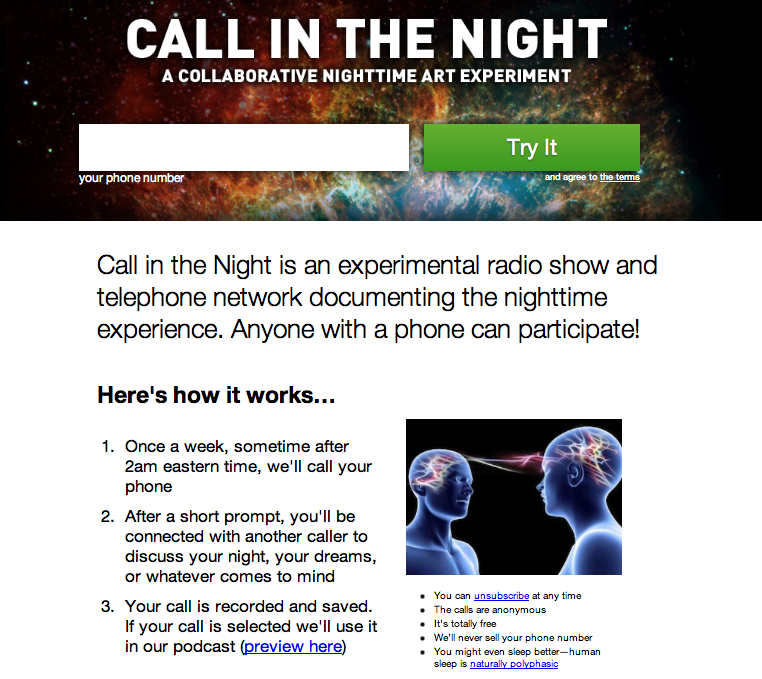 Call in the Night is an experimental radio show and documentary project conducted by telephone, created by Computer Science and Art student Max Hawkins. Once a week, in the middle of the night, participants are caught off guard by a computer-dispatched, nocturnal phone call and connected with one randomly-selected partner to discuss their dreams, their lives, or whatever comes to mind. The calls are recorded and collectively form a “nighttime zeitgeist” that captures the dreams, fears, activities, and personalities of pairs of anonymous people from around the world. Call in the Night was supported by a microgrant from the Frank-Ratchye Fund for Art @ the Frontier (FRFAF)— an endowment founded to encourage the creation of innovative artworks by the faculty, students and staff of Carnegie Mellon University. With this fund, the STUDIO seeks to develop a cache of groundbreaking projects created at CMU — works that can be described as “thinking at the edges” of the intersection of disciplines. Max Hawkins is a graduate of CMU’s Bachelor of Computer Science & Art program.